Argonne automotive engineer Henning Lohse-Busch puts an engine through its paces on Argonne's Modular Automotive Technology Testbed (MATT), a platform that allows different engine components to be observed and evaluated as they operate in a complete vehicular system. (PhysOrg.com) -- Car manufacturers aspire to create hydrogen-powered vehicles that could one day allow energy-efficient, cost-effective travel that emits no greenhouse gases or other pollutants. To further that effort, scientists at the U.S. Department of Energy's Argonne National Laboratory have devised new combustion strategies for hydrogen engines. Researchers in Argonne's Center for Transportation Research have built the Modular Automotive Technology Testbed (MATT), an Erector Set-like platform for automotive powertrains in which engineers can swap in and out different engines, transmissions and other core powertrain components. 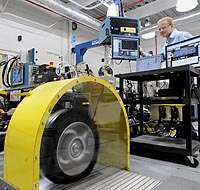 By using MATT, Argonne researchers gain the ability to test a 4-cylinder hydrogen engine on the standard drive cycles. "One of the major advantages of MATT is that it allows us to separately test and benchmark individual components as they work in a system," said Argonne engineer Henning Lohse-Busch. As they put the engine through its paces, Argonne's researchers evaluate the fuel economy and emissions generated by different combustion strategies. Lohse-Busch and his colleagues developed an optimal variable air-fuel ratio combustion strategy that allows a hydrogen internal combustion engine to run efficiently and cleanly in a conventional vehicle. According to Lohse-Busch, these hydrogen-burning combustion engines represent the "bridging technology to the hydrogen economy." Unlike hydrogen fuel cells, which convert hydrogen to electricity through an electrochemical reaction that yields no pollutants, hydrogen internal combustion engines can produce nitrogen oxides (NOx), which contribute to global climate change. Due to the wide flammability range of hydrogen, a hydrogen engine can run at extremely high air-fuel ratios. All else being equal, the leanest combustion allows the engine to run efficiently and reduces emissions. However, the leaner combustion dramatically reduces the power output of the engine. In his work on MATT, Lohse-Busch determined that by varying the air-hydrogen ratio, he could reduce the trade-off between fuel economy, low-NOx emissions and power for these engines. "With a constant air-fuel ratio combustion strategy, you have to sacrifice fuel economy, high performance or low emissions," he said. "The variable combustion strategy that we developed for hydrogen engines resulted in the best fuel economy while achieving very low emissions even without an exhaust after-treatment system." In the future, researchers in the Center for Transportation Research hope to use MATT to marry the hydrogen-burning internal combustion engine with a hybrid propulsion system. This approach, Lohse-Busch explained, would enable Argonne researchers to reap more benefits from both technologies. "With the additional power supplied by a battery," he said,w"e can supply the hydrogen engine with leaner fuel streams, enabling the engine to run more efficiently and cleanly." "one day allow energy-efficient, cost-effective travel that emits no greenhouse gases or other pollutants. Violates conservation of matter and energy. Oxidize hydrogen and what do you get? Water. Water is a "greenhouse gas" several orders of magnitude greater than CO2.